Accommodation at Casa de Alfena. Casa de Alfena has been fully restored to extremely high standards. It was originally part of a group of farm buildings and goldsmith's workshops. The farm buildings are now the Manor House and the workshop is now a Gold Museum. This house has been recognized by the Portuguese Tourism Authorities as relevant to culture, history and architecture. Located on the northern bank of the river Ave, near the Peneda-Geres National Park, the village of Travassos became famous for its skilled goldsmiths. Although decreasing, many workshops still observe traditional methods. Nearby is Povoa de Lanhoso, a small but very interesting town, dominated by an 11th century castle on one of its hills. It is said that the village had its first settlements during the Iron Age as much evidence has been found in the area of Pre Roman remains. The local goldsmiths are believed to be descendents of the original settlers and almost every family in the village has some connection either to agriculture or to goldsmiths. The property has five bedrooms. 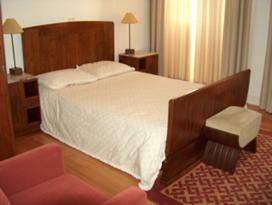 The three bedrooms in the main house have double beds and are fitted with traditional furniture. 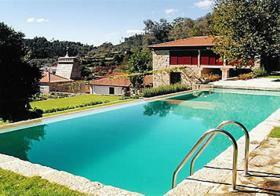 The other two are located in the old converted granary which is adjacent to the house and have views to the pool. Modernly decorated, they are twin bedded and have a mini-bar with fridge and kettle. All bedrooms have television. Two bedrooms in the main house have ensuite shower room. The others have ensuite bathroom. Casa da Alfena has central heating and a fireplace in one of the the living rooms. There is another lounge with cable TV and a games room. The dining room has a table seating up to ten. Outside, there is a very attractive and inviting swimming pool for adults and a children's pool. The swimming pool is 15 x 5 metres with a depth varying from 0,90 to 2,30 metres. During summer months the water is maintained at an average temperature of 30º C. The children's pool is 4 x 2,50 metres with a depth of 0,30 metres. There are also two dressing rooms, with shower and toilet. There are sun loungers on which to relax and enjoy a cool drink, or for the more energetic, there is a table tennis table. There is a mini market approximately 150 metres. A supermarket may be found in Povoa de Lanhoso. The nearest restaurant is at about 3 kms. The historical cities of Braga and Guimaraes are only half an hour away and are both worth visiting. Casa de Alfena can also be taken as a whole unit on a self catering basis. Special rates may apply for 3 night stays minimum during the low season.